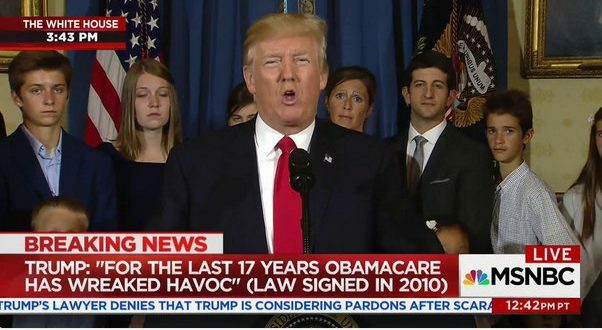 Trump Bemoans "17 Years Of Obamacare Havoc" - Joe.My.God. President Donald Trump began his statement on health care this afternoon by incorrectly saying that Obamacare was passed 17 years ago. “For the past 17 years, Obamacare has wreaked havoc on the lives of innocent, hardworking Americans,” Trump said at the very top of a statement delivered from the White House on Monday. Not counting Trump thanking everyone for being there today, this was the very first sentence of his speech. Trump just said Obamacare has been around for 17 years, but in his defense, the last six months have felt like 10 years. 3) The hostages behind him look terrified. He meant, "For 17 years, syphilis has been wreaking havoc on my cerebral cortex…"